NEW YORK The Dow has never been higher. 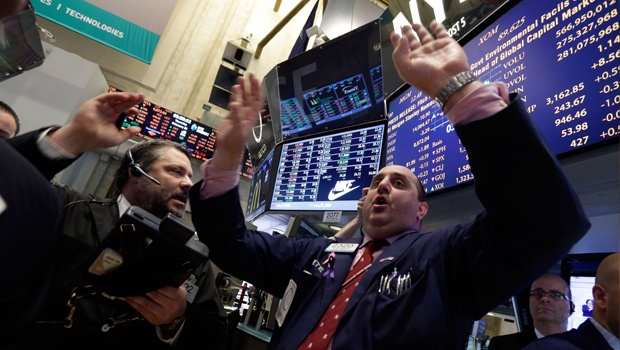 The Dow Jones industrial average surged past its record high and kept going on Tuesday. It jumped from the opening bell, climbed as much as 158 points early and reached 14,286, breaking through its previous record high set in October 2007. The Dow opened higher following a surge in markets across the globe. China's markets rose after the government said it would support ambitious growth targets. European markets jumped following a surprisingly strong rise in retail sales across the 17-country group that uses the euro. In the U.S., more hopeful news about housing kept the momentum going. The gains represent a remarkable comeback for the stock market. The Dow has more than doubled since falling to a low of 6,547 in March 2009 following the financial crisis and the Great Recession. Stocks have rebounded sharply since then, helped by stimulus from the Federal Reserve, even as the economic recovery has been slow and steady. Time to invest in Apple? Dow hits new high: Time to sell? "Whether they want to admit it or not, everyone is very impressed with the resilience of the market," said Alec Young, a global equity strategist at S&P Capital IQ. The last time the Dow was this high, Apple had just sold its first iPhone and George W. Bush had another year as president. The U.S. housing market had yet to bottom, and the financial crisis that brought down Lehman Brothers was still a year away. The recovery in stocks may even have been quicker had memories of the financial system's near-collapse not been on investors' minds, says Robert Pavlik, chief market strategist at Banyan Partners. "It's still pretty close to the front of people's brains," says Pavlik. "That's one of the reasons that people are hesitant to invest in the stock market." That could be changing. More money has been flowing into stock mutual funds since the beginning of the year. Investors who have missed out on the run-up may be deciding to get off the sidelines, Pavlik said. Even with stocks trading at, or close to, record levels, they are still a good investment because earnings have risen so much, says Darell Krasnoff, Managing Director at Bel Air investment Advisors. "People get overly focused on benchmarks," says Krassnoff. "The fact that it's reached that level is an interesting landmark, but it doesn't say anything about whether the market is over-, or under-valued." Stocks are also attractive compared to bonds after a rally in the debt market that pushed yields to record lows. The yield on the 10-year Treasury note, currently at 1.90 percent, is still lower than the yield of about 2.1 percent on the S&P 500. Despite the rise in the Dow, the U.S. economy has not fared as well. Unemployment was just 4.7 percent when the Dow last reached a record five and half years ago, versus 7.9 percent today. But the economy is strengthening in many areas. Housing is recovering, companies are hiring more and Corporate America's earnings are strong. That helped drive a 9 percent rise in stocks this year, impressing even the most ardent skeptics. For all of last year, the index rose 7 percent. Stocks are also benefiting from the economic stimulus from the Federal Reserve and other global central banks. Under a program called "quantitative easing," the Fed has bought trillions of dollars of bonds, pushing up their prices and sending their yields lower. That makes stocks more attractive to investors than bonds and keeps interest rates low throughout the economy, encouraging investment and spending. The U.S. central bank began buying bonds in January 2009 and is still purchasing $85 billion each month in Treasury bonds and mortgage-backed securities. If the Dow continues Tuesday at its torrid pace, it will finish above its record close of 14,164 from Oct. 9, 2007. Tuesday's gains were driven by industrial and technology stocks. United Technologies rose $1.88 to $91.02, IBM advanced $1.47 to $206.60 and 3M rose $1.43 to $104.70, pushing the Dow higher. That's a signal that investors are optimistic about the economy, since those companies stand to gain the most when the economy recovers. More stable, conservative stocks like utilities and consumer staples logged smaller gains. From its March 2009 low to today, gains for the 30-member Dow have been led by American Express, up almost 500 percent. Home Depot has jumped almost 300 percent, according to data from S&P Dow Jones Indices. Hewlett-Packard (HPQ) is the only stock in the index that is lower than it was four years ago, falling 22 percent. On Tuesday, investors received another piece of positive news on the U.S. economy, a report that U.S. service companies grew in February at the fastest pace in a year, thanks to higher sales and more new orders. The gain suggests higher taxes have yet to slow consumer spending on services. The Standard & Poor's 500 index rose 16 points, or 1 percent, to 1,541, within striking distance of its own record close of 1,565. The Nasdaq composite gained 41 points, or 1.3 percent, to 3,223. The yield on the 10-year Treasury note rose two basis point to 1.90 percent. Ascena Retail Group (ASNA) gained $2.30 to $18.84 after the clothing store reported stronger-than-expected sales in its most recent quarter. J.C. Penney (JCP) fell $1.52 to $15.21 following media reports that one of its largest shareholders is selling a major stake in the retailer. CNBC and The Wall Street Journal reported that Deutsche Bank is shopping around the sale of 10 million shares of the company's stock held by Vornado Realty Trust, a real estate investment trust.